Life has been a little crazy lately. Just busy, really. I suddenly have lots of work taking portraits - something I said I’d never do! I’ve really been enjoying it though, it’s a whole new experience for me. It’s fun to try and get people to smile and laugh, and to capture their love for each other. It’s fun, but also sort of stressful, since it’s so new to me. It was nice to spend some time in the kitchen today, decompressing. It’s so calming, I can get lost in the measuring, stirring, kneading. I love the process. That’s my very favorite thing about baking, I think, and why I enjoy it so much. These scones were originally supposed to be biscuits, I saw a pictures of them on Shannalee’s photostream, a recipe from Fresh365. I knew I wanted to try them right away. I had cherries in the fridge and rosemary in the garden, but no cheese, so they evolved into scones. I’d never tried cherries and rosemary together before, which is a shame because it is a delightful combination. They work perfectly together. These would be awesome for breakfast, lunch or dinner. I spread some of my homemade sour cherry jam on them and ate them at 4 in the afternoon. Preheat oven to 375F. In a large bowl, combine flours, baking powder, baking soda, salt and sugar. With a pastry blender or two knives, cut in butter until mixture resembles coarse meal. Stir in cherries and rosemary. Make a well in center; add heavy cream, using your hands, pull dry ingredients towards center until all is combined. Transfer dough to a lightly floured work surface; knead a couple of times. Pat into an 8-inch disk. Using a knife or bench scraper, cut into 8 pieces. Cover with plastic wrap, freeze for 1 hour or overnight. Preheat oven to 375F. Place on a parchment lined baking sheet and bake for 30-35 minutes. Best served slightly warm. hi hannah - as i write this i, too, am making rosemary scones (tho of another recipe)! no cherries involved today, but i know rosemary works great with cherries (and many other fruits) - your scones look lovely! A fabulous flavor combo! those scones must be delicious. What splendid shots! I saw that recipe too....looks so delicious! I love that you made them into scones. Nice! Yum! These look fantastic. Your words and photos are both so beautiful. delicious! I love the combination! These look super amazing!! Love these flavors!!! Oh my, what a delicious flavor combo - cherries & rosemary?! Must give these a try...perfect for an afternoon pick me up! do you like the WW pastry flour - AP flour blend? i've done a blend of regular WW and AP flours, with decent results, but i'm betting yours have a much more tender crumb and weren't as chewy. now that i see it, seems like the concept should've been common sense... onward to a better scone! SUCH beautiful shots!!!! :)I adore all the negative spaces and bright white space! MMMMMMM! These sound so delicious. I love fruits with herbs and scones are always a winner here. This combination does sound good together, bookmarked to make very soon! i love the sound of these two together...makes me think they might be good in corn muffins too. i really want to to try this. What a great combination of flavors. I currently have a Rosemary forest growng. This is a good way to use it. Those look really delicious. I've never thought of the two together either, but they do seem like a good match! I've been trying my hand at portrait photography, too... it's challenging, no? I photographed a 4 month old last week and I had *no earthly idea* how to make her smile, how to pose her... ack! My friends and family are enthusiastically signing on for my well-priced (free, for good reason) portrait sessions and it's great because they get one or two keepers and I learn tons. From the little I've seen of your photography, you have an amazing eye. I'm sure you'll go far, no matter which direction you choose! So glad you've got your camera back! I've missed your lovely talent. These scones sound (and look) positively delicious. Oh, they look and sound so delicious! What a lovely recipe! I have never tried cherries and rosemary together either, but it definitely sounds very tempting. I should give it a try soon! I'm so happy for you that you enjoy taking portraits, because you are doing it fantastically! this makes me so hungryyyyyy. First, I must say...I love scones! any kind! Then I must say...rosemary and cherries..what an interesting combination. I'll bet those scones taste delicious! these look soooo yummy!!! i will definitely try these recipe! Hannah, I love your portraits! You have such a natural talent for it; you should definitely keep doing it if you're enjoying it. I really need to carve some time out to make scones. They are so much better fresh from the oven than purchased in the store. Thank you for sharing! what an intriguing flavor combination! the scones are beautiful and enticing--well done! Everything that you make just looks so divine. These sound so delish! Great photos! Looks delicious! Your photos are always gorgeous! 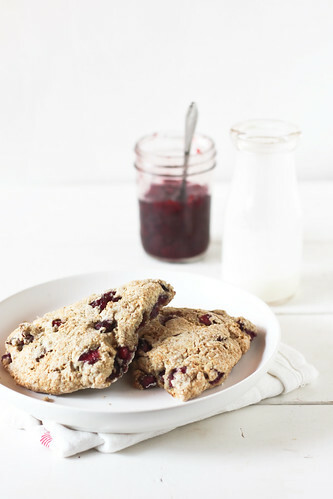 These sound great, I have a recipe for buttermilk scones with dried cherries that I have been meaning to try out, and the addition of rosemary would make it so much more complex! 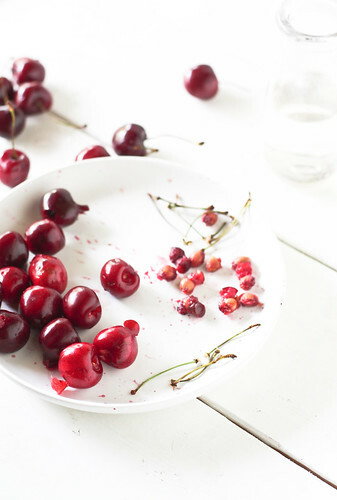 I love your photos of the cherries, making my mouth water. :) Also, congrats on your success so far with portrait-taking! 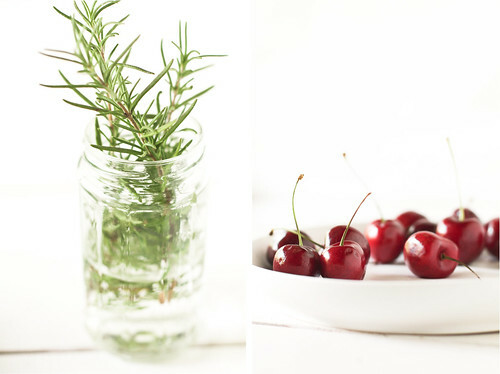 I love the combo of cherries and rosemary... Lovely! What a beautiful combination of flavors! I love this! These look wonderful. I am so glad your back to blogging. Missed your lovely posts. Hi Hannah - Do you think plain yogurt would work in place of heavy cream? I don't have any cream here now...The scones sound amazing! Such a great combination--I need to remember to use savory herbs with sweet creations more often, since they can be so great. Rosemary and Honey scones would be great idea too! Ive always wanted to posted here and I finally decided to do it! such a beautiful and effortless blog...awesome job I'm loving it.. These scones look delicious, but also a little like a bizarre mushroom known as Bloody Tooth Fungus that secretes a red liquid.